Vegetables are all the parts of a plant that are consumed by humans as food as part of a meal. Eating vegetables provides both considerable health benefits and provide nutrients which are key elements to the maintenance of our body. More generally, vegetables, together with fruits, are part of an overall healthy and balanced diet that may reduce risk for heart disease, including heart attack and stroke. Globally the amount of vegetables produced are huge. Similarly, in most European countries the number of companies producing fruits and vegetables and the purchase frequency of vegetables is considerably high. It is also worth noting the increase in the number of people adopting a vegetarian diet, which includes mostly grains, pulses, fruits, vegetables, seeds and nuts, with or without dairy products, honey and/or eggs. Vegetable production can either be outdoor or in greenhouses. The application of one of the two methods mentioned is highly dependent on the meteorological conditions in which vegetables are expected to grow. Spain and Italy, two of the most important producers of vegetables in Europe in term of economic value, mostly experience production on the field. Conversely, the Netherlands relies mostly on greenhouses, although the number of greenhouse horticulture farms has been declining. Among member states of the European Union, Spain is the main supplier of vegetables, with an export value of roughly 5.4 billion euros as of 2015. Likewise, Italy is among the leading countries supplying fresh vegetables, with a sales value amounting to over 2.2 billion euros as of June 2016. 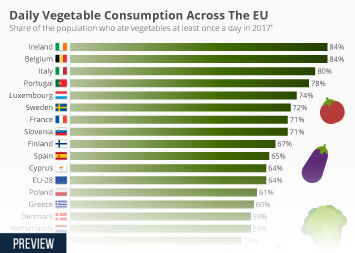 Countries located in the north and west of Europe register a bigger market share for frozen vegetables. For instance, in Belgium the consumption of frozen vegetables amounted to 3.7 kilograms per person. In line with this trend, Danish families spend roughly 204 Danish kroner annually on purchasing frozen vegetables. More interesting topics from the industry "Fruit & Vegetables"